The Corps members who helped the earth duo escape are tortured and depowered on Oa. Elsewhere Stewart and Guy use remnants of the Guardians creations such as manhunters, Psions and alpha lantern parts to create a force to combat the alpha lanterns on OA. Stewart and Guy along with their makeshift army attack the Alphas but are taken down while their creations are destroyed. All the pieces however reform into a monstrous Amalgam of flesh and robotics still intent on taking down the Alphas. 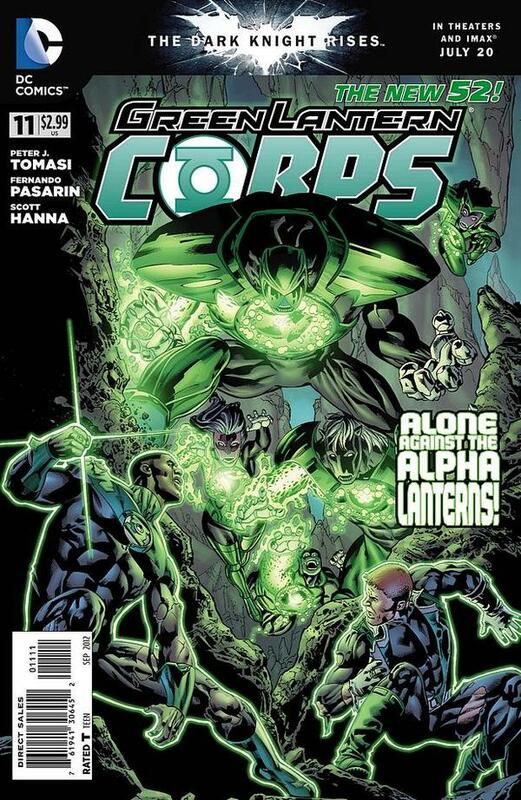 Salak also assembles the corps to oppose the Alpha Lanterns. Art- Fernando Pasarin is as always damn good on art duties with distinct alien creatures, statuesque earthlings and weird unknowns. Also of note is Gabe Eltaeb on colors, the vibrant bright greens accentuate the whole thing well. Cover-Awesome cover! Gorgeous glowing green, while both Guy Gardner and John Stewart prepare for showdown with the Alpha Lanterns. According to solicits this is where Alpha war ends but this “conclusion” had no definitive ending making it lack the finality of what one would expect from a “story arc”. Text- Strangely this issue was plagued by tiny words. I literally had to squint to see some pages, weird.